It’s a rare opportunity for a publisher to find a story that is relevant to the times, riveting in its drama, and redeeming in its content. In a world where fear is fueled by threats and morals plummet like the economy, Lamplighter offers hope. 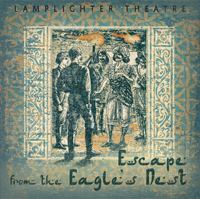 Escape from the Eagle’s Nest is an action-packed drama that takes place in war-torn Afghanistan, circa 1867. Abandoned and alone, Walter faces a moral dilemma that lands him in the midst of a ruthless, hostile land. Even though he saves the chief’s child from the mouth of a lion, he still faces certain death from his Islamic captors. But Walter lives with the “sentence of death in himself already, that he should not trust in himself, but in God, who raises the dead” (2 Corinthians 1:9). For a gripping story that will help shape your worldview concerning a Christian’s responsibility to the Islamic culture, reach for Escape from the Eagle’s Nest. When you do, you’ll understand why it was chosen Lamplighter’s Book of the Year! From Anonymous of Ocala, Florida on 3/22/2017 . I have started reading this book and have been enjoying it so far! I love the deign cover and the quality of the leather is wonderful. I love Lamplighter!! !